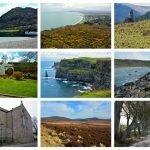 Ireland Road Trip - Top 10 Best Scenic Drives in Ireland Not to be Missed! With Ireland’s landscape so wild and rugged, the temptation to rent a car and head out in search of adventure is simply too great to resist! And don’t be intimidated about driving in Ireland. If you’re not used to driving on the left, it’s not as scary as it sounds. We’re going to share with you what we consider to be the Top 10 Scenic Drives. You’ll then know just where to go on your Ireland Road Trip adventure once you’ve picked up your rental car. 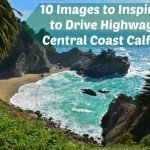 For this post, we’re assuming you’ve rented a car, but if you haven’t, know that there are several tours that will also take you along some of these scenic drives. Check out our Day Trips from Dublin post for some samples of guided tours along scenic routes. The Wild Atlantic Way is a scenic Ireland road trip navigating 1553 miles (2,500 km) along Ireland’s rugged west coast. Drive the entire route from County Donegal in the north to County Cork in the south or simply pick and choose various portions to explore. Either way, you will quickly see why this route has become so wildly popular! It speaks measures that 8/10 of our recommended driving routes are part of the Wild Atlantic Way (denoted with a *). 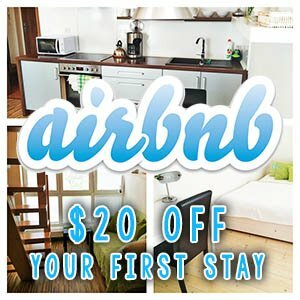 TIP: Before you head out, download the free Wild Atlantic Way app, which includes places to see (15 Signature Discovery Points & 160 Discovery Points), where to sleep and eat, festivals and events, and local secrets. While the middle of the country has much to offer, the coast is where it’s at! Try to put the passenger on the coastal side when considering the direction of your journey. This allows your passenger to snap some pretty epic shots while on the road. It also puts your vehicle right next to the scenic views, as opposed to having a lane of traffic between you and the coast. 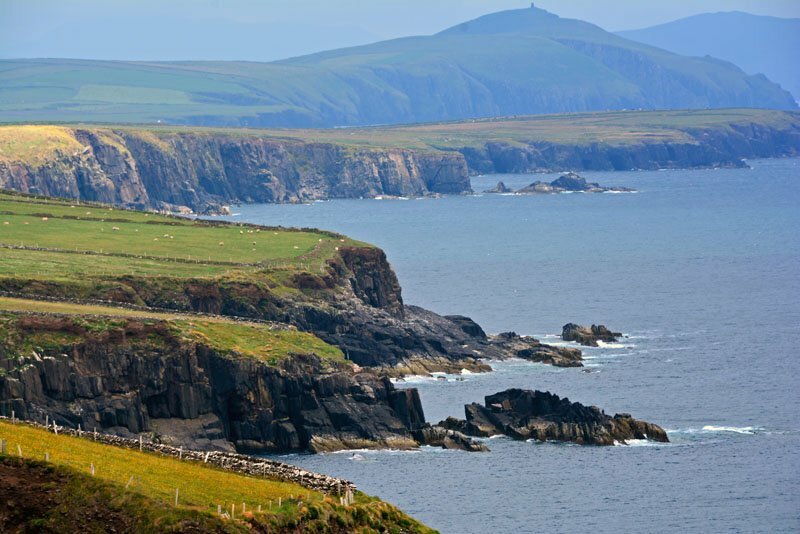 Located just north of the famed Ring of Kerry drive, some may argue that the views along the Dingle Peninsula (Slea Head Drive) rival that of those on Ireland’s most famous scenic driving route to the south (Ring of Kerry). The 30-mile (48 km) circular drive around Slea Head begins and ends in the town of Dingle with several notable landmarks along the way. These include Dunbeg Fort and Pre-Historic Beehive Huts, the Dingle Famine Cottage, and the Gallarus Oratory. Spectacular views of the Blaskets Islands, Ventry Beach, and Coumenole Beach can also be seen along the route. Even though the drive is only 30 miles, give yourself a half-day for this Ireland road trip. Trust us, you’ll want to stop often to enjoy the views and take photos. While on the peninsula, take a white-knuckle drive through Conor Pass, Ireland’s highest mountain pass. 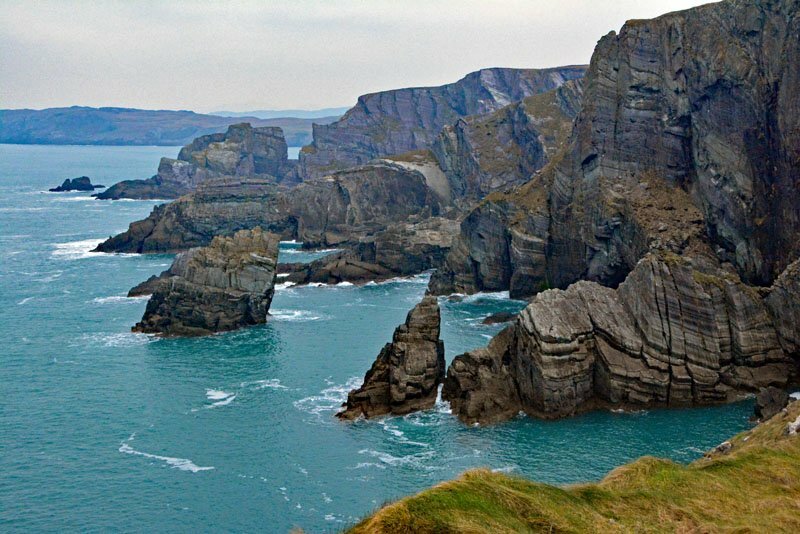 Head on over to our Dingle Peninsula post for even more detailed information about this gorgeous drive in western Ireland. 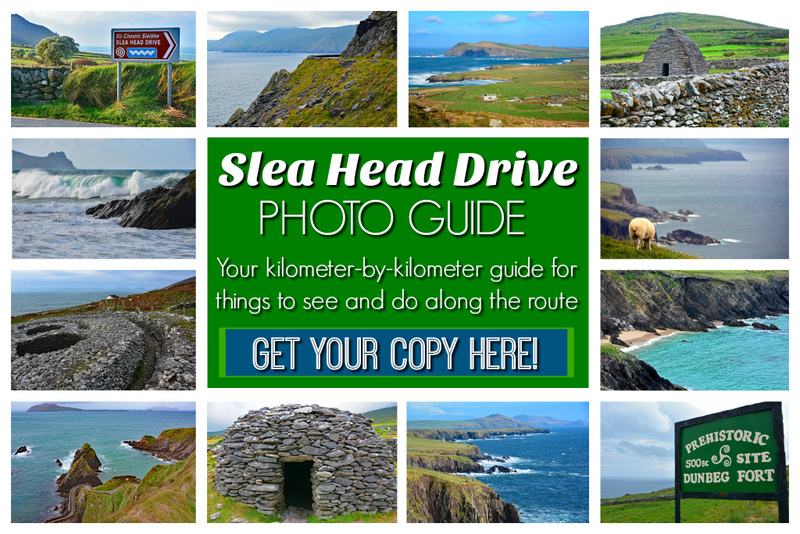 If you’d like a guide to print out and bring with you, consider purchasing our Slea Head Drive Photo Guide. We’ll guide you kilometer by kilometer, pointing out highlights and hidden gems along the route. Learn the fascinating history behind the many archeological sites found on the drive. 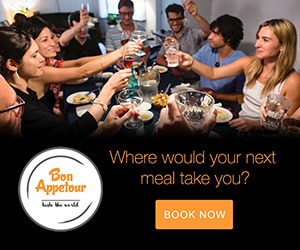 Gain quick access to admission costs, opening hours, and contact information for popular attractions. The Ring of Kerry is the most famous and well-traveled Ireland road trip. Take in views of preserved and ruined castles, rugged coastlines, and splendid mountain passes as you explore this 111-mile (179 km) circular drive around the Iveragh Peninsula. 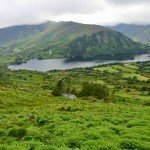 Points of interest include Killarney National Park, the Gap of Dunloe, Muckross House, Torc Waterfall, and the oh-so-scenic Ladies’ View, to name a few. Tour buses drive the route in a clockwise manner. If you’re doing the drive in a rental car, you have two options. You can either follow suit to avoid having to pass the buses head-on on the narrow winding roads or travel in the opposite direction (counter-clockwise) to avoid getting stuck behind one of these massive tourist transporters. Many people try to do the entire drive in a day, but we recommend you break it up into two days, so you can enjoy all the route has to offer! 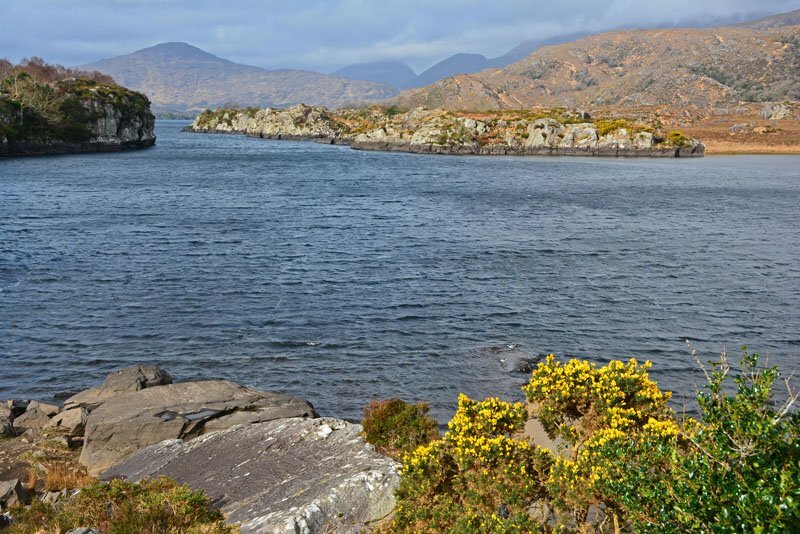 The 92 mile (148 km) Beara Peninsula drive spans two counties and is the perfect scenic day trip to do if you want to avoid the crowds often found on the nearby Ring of Kerry and Dingle Peninsula. The peninsula is flanked by Kenmare River to the north and Bantry Bay to the south. Running down the center of this spit of land are two mountain ranges, the Caha & Slieve Miskish Mountains. The drive around the peninsula starts in Kenmare and crosses Healy Pass, before navigating small towns such as Castletownbere, Allihies, Eyeries, and Ardgroom. This scenic drive ends in Glengarriff, where you’ll find a forest containing some of the oldest oak trees in Ireland. It was raining the day we drove the route, so we didn’t get out of the car much. Despite this, we were still able to enjoy the spectacular views along this portion of our Ireland road trip. A drive along the Kilmore Peninsula is just over 60 miles (100 km), so it’s a great addition to your Ireland road trip. The Mizen Head Signal Station, located at the farthest point on the peninsula, is geographically the most southwesterly point in the entire country. (The station is open daily March-October, but only on the weekends November-February.) Here you will stand in awe at the views over Dunlough Bay. If you’re lucky, you may spot a dolphin or maybe even a minke, fin, or humpback whale! Other points of interest along the peninsula drive include the Twelve Arch Bridge in Ballydehop, the ruins of St Mary’s Church in Schull, and Alter Wedge Tomb. Be sure not to miss a stop at O’Sullivan’s Pub in the tiny town of Crookhaven. We recommend you try one of their open-face crab sandwiches! YUM! To see more pictures from our drive along both the Kilmore and Beara peninsulas, check out this combo post! Achill Island (57 square miles/148 sq km) is the largest island off the coast of Ireland and you don’t need a boat to access it! A bridge easily connects the island to the Corraun Peninsula on the mainland. Shortly after crossing over the bridge, turn left at the sign for The Atlantic Drive. Follow this route to explore the dramatic coastline along Achill Sound. 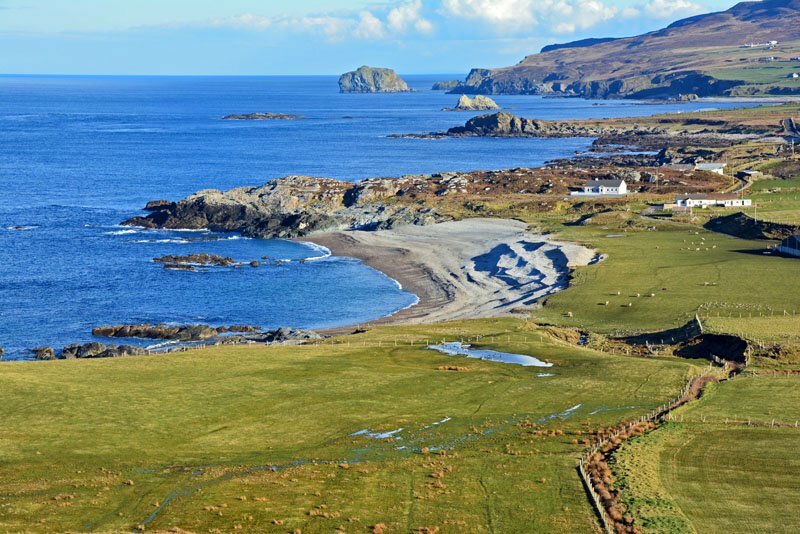 Along this scenic drive you’ll have glimpses of the islands of Clare and Achill Beg, as you pass through the quaint villages of Shraheens, Derreens, and Cloughmore. Once you finish your journey along The Atlantic Drive, continue on west toward Keel and onto Keem, where the road eventually dead ends at a gorgeous beach. 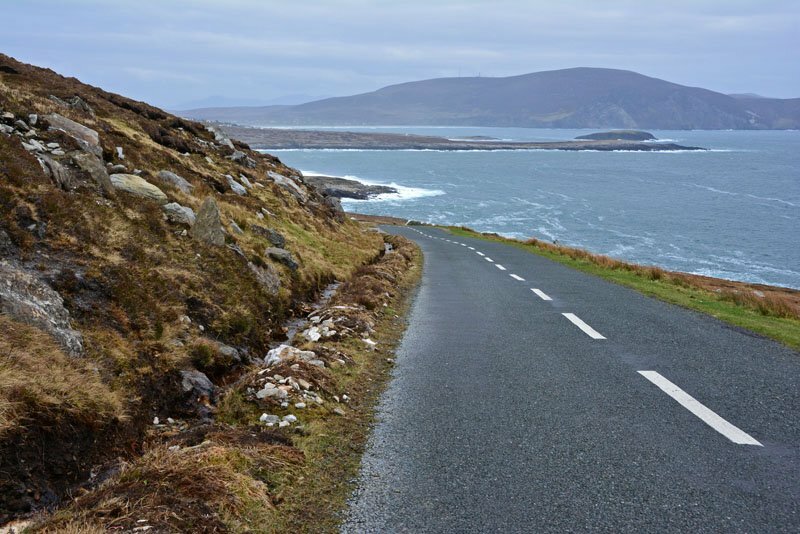 Though the route described here doesn’t showcase all there is to see on Achill, you can pair this abbreviated drive on the island with a visit to the nearby Ballycroy National Park, if time permits. 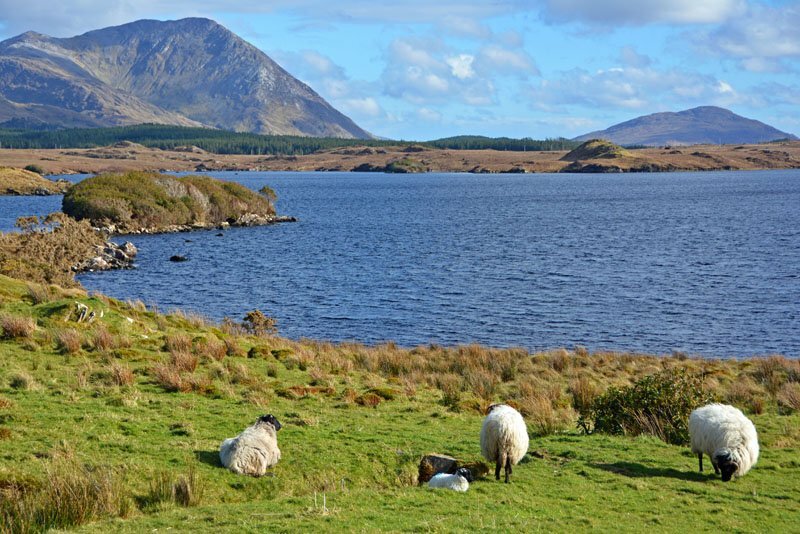 While not all visitors to western Ireland make it this far north, we consider Connemara to be an unspoiled gem; a stunning region of the country begging to be explored. 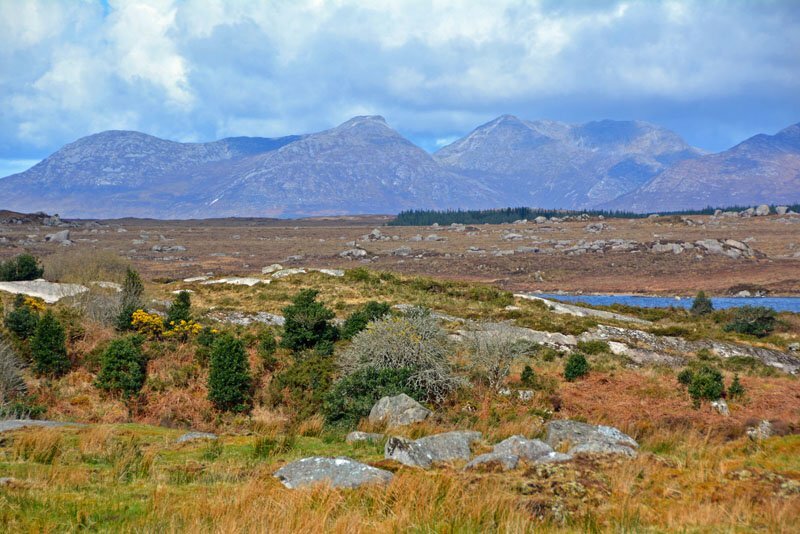 The Connemara Loop is a fantastic way to discover much of the beauty this region has to offer, including its many beaches and lakes. Starting your journey at Maam Cross, traveling in a clockwise manner, you’ll pass through the ridiculously scenic Inagh Valley as you make your way toward Kylemore Abbey & Gardens. Not far from the abbey you’ll find Connemara National Park, home to Diamond Hill, a moderately strenuous 2-3 hour hill walk. Take a scenic tour of Renvyle Peninsula and pass Killary Fjord, Ireland’s only fjord, on your drive along the loop. (Though it requires a small detour from the Loop, consider a drive on Sky Road near the town of Clifton for even more impressive views.) Also, be sure to stop off at Paddy Coynes Pub in Tully Cross to experience a true Irish gathering place. This may not be an official designated scenic route, but it’s one that deserves mentioning and consideration for your Ireland road trip. A small stretch of this route also makes up part of the nearby Connemara Loop, but it’s only an overlap of a few miles. To follow our self-made route, start in the village of Leenaun near Killary Fjord and travel southeast on R336/345 toward Cong, one of Ireland’s cutest little villages. Visit Cong Abbey and take a nature walk through the nearby forest. Then trust us when we say it’s worth the little detour to go check out the nearby Ross Friary. On your way back toward Leenaun, navigate to Lough Nafooey in order to take a different route back with more gorgeous views. Now you’ll take a counter-clockwise circular route, starting on N59 and continuing on R335, until you circle all the way around back toward Leenaun. Highlights of this section of the drive include Aasleagh Falls, Croagh Patrick, beautiful beaches and coastline, along with the picturesque Doolough Valley. 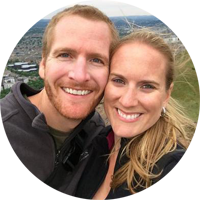 If time permits, feel free to hike to the summit of Croagh Patrick (about 3.5 hours roundtrip). A drive through Sally Gap may not offer dramatic coastlines and countless stopping points like the majority of our other recommendations, which is precisely why we added it to the list! Experience expansive open spaces with nothing but natural beauty as far as the eye can see. Located in the Wicklow Mountains, Sally Gap sits at an elevation of over 1,600 feet (503m). For this reason, you may want to avoid this drive when snow is present, as it is not cleared by the local authority. Close to ‘the gap’ is Glendalough, home to one of the most important monastic sites in Ireland. 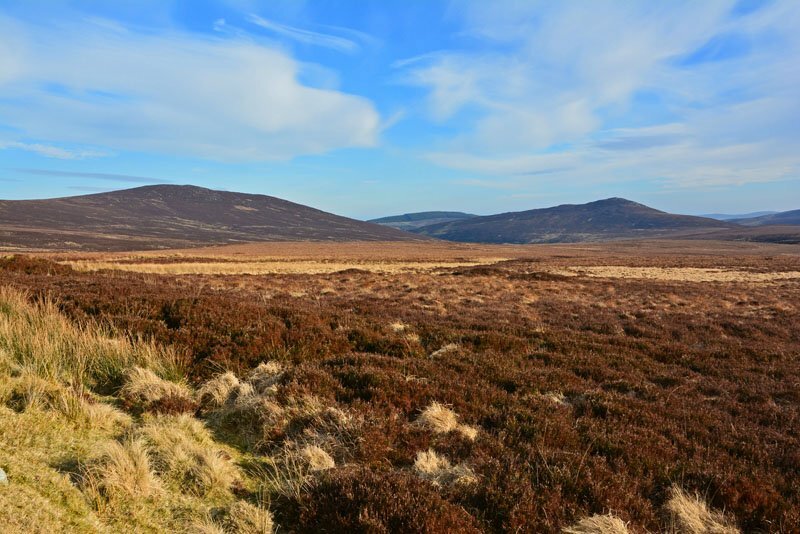 So, if you’re looking to experience some of Ireland’s natural beauty without venturing too far from Dublin, head south on your Ireland road trip to Wicklow National Park. Want to visit Ireland’s northernmost point and see some breathtaking scenery along the way? Take a drive along the Inishowen 100, named for its approximate length in miles around the Inishowen Peninsula in County Donegal. Discover route highlights such as Inch Island, the Stone Fort of Grianán of Aileach, Dunree Beach, the Gap of Mamore, Glenevin Waterfall, and Malin Head, the most northerly point of the island of Ireland. We also hear the Rusty Nail Pub is worth a visit! Whether you enjoy historical sites, hiking, getting out on the water, or any combination of these activities, you will thoroughly enjoy your journey around the Inishowen Peninsula. From here, you can continue on over into Northern Ireland to experience our next and final recommended scenic route for your Ireland road trip. If you plan on venturing into Northern Ireland, you will definitely want to put this coastal route on your Ireland road trip itinerary. The drive is broken up to into 4 smaller routes. Depending on your available time, you can do just a portion or drive all 310 miles (212 km) from Londonderry to Belfast. 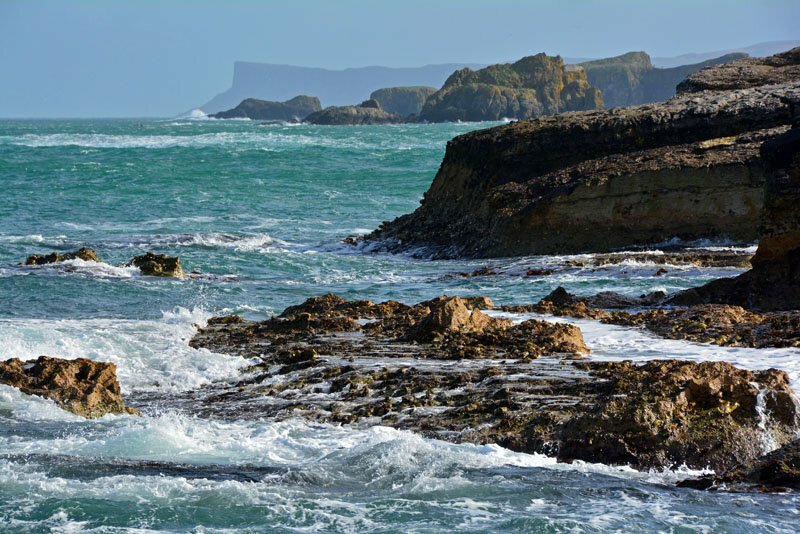 It basically picks up where Ireland’s Wild Atlantic Way ends, so no doubt you’ll see some eye-catching scenery as you explore the country’s continuous coastline. Discover Giant’s Causeway, the Dark Hedges, and Carrick-a-Rede Rope Bridge. 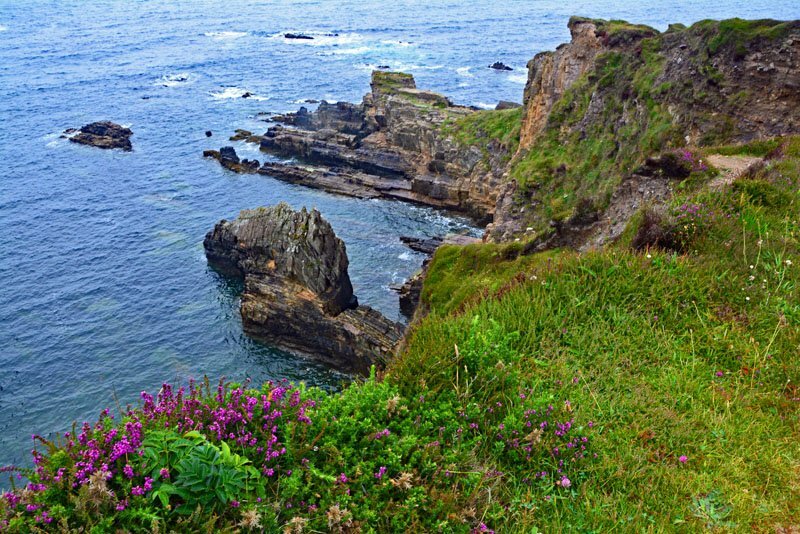 You’ll also experience castle ruins, coastal walks, parks, harbors, distilleries, and everything from small villages to the bustling city of Belfast as you travel this coastal route! So, there you have it! These are what we consider to be the Top 10 Best Scenic Drives in Ireland. We hope this helps you plan your very own ultimate Ireland Road Trip! 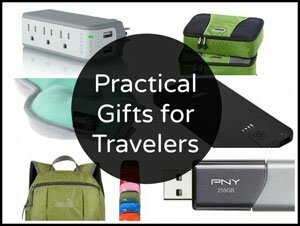 Planning a visit to Ireland?! 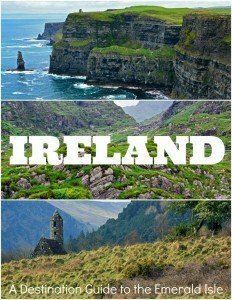 Check out our massive Ireland Destination Guide! We’ve done parts of the Causeway Coastal Route and it was fantastic! Such a beautiful drive seeing Giant’s Causeway, Carrick-a-Rede Rope Bridge and a few beautiful castles. We didn’t have time to see everything but we did stop at the Bushmills Distillery for a wee drink. Next time I think I would like to do the drive along the Kilmore Peninsula it looks like it has fantastic scenery.